"Legion of Super Heroes in the 31st Century #11"
J. Torres is a writer currently writing issues of "Legion of Super Heroes in the 31st Century" for DC Comics. 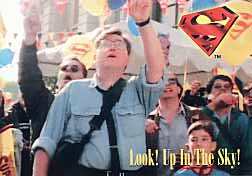 Superman Homepage writer Adam Dechanel interviewed J. Torres about issue #11 of the comic book. Q: How do you deal with criticism when you place your work in the public eye? A: Well, you have to take the good with the bad. Either way, it's also important to consider the source and how the criticism is framed. If it's constructive and well articulated, learn from it. If someone simply posts, "this issue sucked!" you give it about as much time it took to type that out. A: I just try and take my cues from the animated series, the source material. 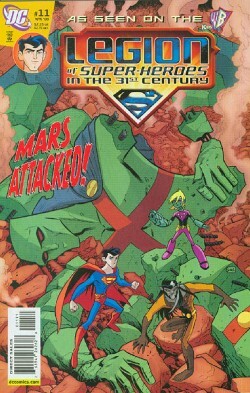 For example, with Teen Titans, the show started out mostly fun and action-oriented, slightly goofy and over-the-top at times, but as the seasons progressed, the series evolved and they ventured into some darker territory, told some more serious stories, and even broke their own rules regarding things like not having alter egos and not telling origins. The stories we told in Teen Titans Go pretty much followed suit. The same goes for the Legion cartoon and what I try to do in the comics. Q: Clear something up for the readers, the book had hinted at links to Justice League, Justice League Unlimited and Superman: The Animated Series... is this something you'll be addressing? A: Peripherally, perhaps, like the way I did in #11 with references to J'onn J'onzz past. That's part of the fun working on these books, you get to play in such a big sandbox and not worry about continuity as much as you have to writing for the DCU, or even need to get the okay from editors of other books and other "red tape" like that just to mention a character. It's fun! Q: How closely do you work with the show's creative team? How interesting/enjoyable/difficult a process is it? A: Unlike with Teen Titans Go, I haven't really had the chance to confer with anyone working on the Legion cartoon. Q: One thing which was obvious over in JLU was closure was never allowed with things like the John Stewart/Vixen/Shayera love story or ending the series climax with Lex/Darkseid. Can you reveal any 'no-go' areas? Q: Is it easier to write for the regular DCU or for a specialist book such as this? A: For me, I find it easier to work on a book with less baggage, if you will. While the DC cartoons have tons of history and continuity to mine, you get to kind of pick and choose and not have to worry about characters being used in other books or how your story might affect the work of someone else on another title. You have this pocket universe to play in and it's quite liberating. You get away with more, although you'd think it should be the opposite because you're working on "kids books." Or maybe it's just me. Q: Any sneaky hints for the readers of future plans? We appreciate you taking the time to give us a glimpse behind the scenes, thanks for giving the fans a chance to interact with you, you're welcome back anytime!